There is a dawning of a new era in the NASCAR Camping World Truck Series. One day following his 18th birthday (June 11), John Hunter Nemechek is back in the driver’s seat for good. Nemechek, who has been sharing seat time with his father Joe in the No. 8 Chevrolet, will become old enough to be eligible to finish the remainder of the NCWTS schedule beginning in Saturday’s American Ethanol presents the Drivin’ for Linemen 200 brought to you by Ameren (8:30 p.m. ET on FOX Sports 1). John Hunter – a member of the NASCAR Next initiative highlighting the sport’s top up-and-coming drivers – has competed in two NCWTS races so far this year, logging finishes of 29th at Martinsville and 22nd at Dover. He had problems with his equipment in both events. In 14 career races, he claims one top-five and six top-10 finishes. The Mooresville, North Carolina native won the prestigious Snowball Derby Late Model race at Five Flags Speedway in Pensacola, Florida in December. Last season at Gateway, Nemechek led 53 laps before a late spin relegated him to 15th. His performance led to praise on Twitter from a litany of drivers, including Tony Stewart, Dale Earnhardt Jr. and Danica Patrick. Joe will take in the event as a guest analyst in the MRN booth. The 1992 XFINITY Series champion has won 20 NASCAR national series races in his career (16 XFINITY Series, 4 Sprint Cup Series). Notes: This weekend’s race at Gateway is the first time NASCAR Camping World Truck Series teams have run either of these two tire codes . . . compared to what was run at Gateway last season, this left-side tire code (D-4632) features a compound change for more grip, while this right-side tire code (D-4644) features Goodyear’s multi-zone tread technology . . . the multi-zone tire combines two distinct compounds on the same tire — one for endurance and heat resistance on the inboard two inches of the tread, and one for grip on the outboard 10 inches . . . most recently, this tire set-up was run by Sprint Cup and Xfinity teams at Richmond earlier this season . . . as on all NASCAR ovals greater than one mile in length, teams will run inner liners in all four tire positions at Gateway . . . air pressure in those inner liners should be 12-25 psi greater than that of the outer tire. 14 13 Cameron Hayley # Toyota Cabinets by Hayley / Carolina Nut Co.
Matt Crafton has been crowned NASCAR Camping World Truck Series champion two seasons in a row. A primary reason for that unprecedented feat: He’s been king at 1.5-mile tracks. In nine starts at intermediate courses dating back to Kansas last year, the No. 88 Toyota Tundra driver has tallied two wins, three runner ups and nine top-10 showings. His average finish in the nine starts – 3.4. 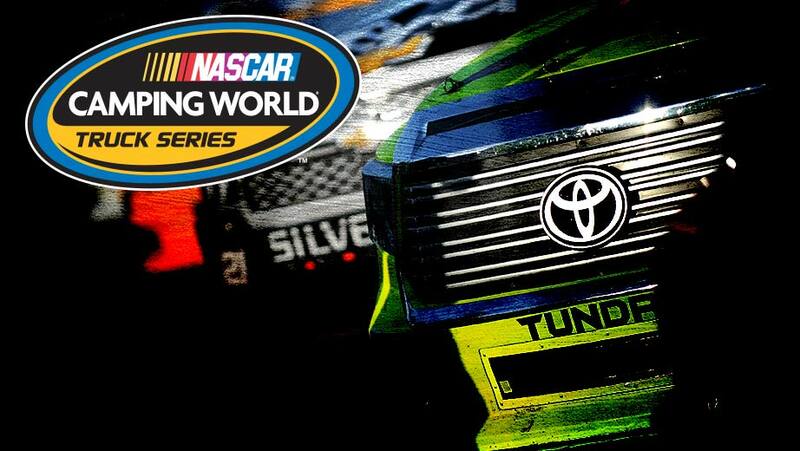 Crafton will attempt to continue his reign at 1.5-mile tracks in Friday’s Toyota Tundra 250 at Kansas Speedway (8:30 p.m. ET on FOX Sports 1). He has started all 14 NCWTS races at Kansas, more than any other driver. He is also tied for the track record with three top-five finishes. Notes: Teams in both the NASCAR Sprint Cup and Camping World Truck Series will run the same combination of left- and right-side tires at Kansas this weekend . . . while these teams ran this left-side tire code (D-4604) at this track last season, this is the first time they have run this right-side code (D-4630) at Kansas . . . for Sprint Cup teams, compared to what they ran in at Kansas in 2014, this right-side tire features a construction change that brings it into line with what is run at other speedways . . . Cup teams have run this right-side at both Las Vegas and Talladega already this season . . . for Camping World Truck teams, who ran their own right-side at Kansas last May, this tire features both a construction and slight compound change . . . as on all NASCAR ovals greater than one mile in length, teams are required to run inner liners in all four tire positions at Kansas . . . air pressure in those inner liners should be 12-25 psi greater than that of the outer tire. 13 13 Cameron Hayley Toyota Cabinets by Hayley / Carolina Nut Co.
Fresh off its first NASCAR XFINITY Series driver championship – powered by the efforts of then-18-year-old wunderkind Chase Elliott (the youngest title-winner in NASCAR national series history) – JR Motorsports makes its first foray into the NASCAR Camping World Truck Series, debuting at Martinsville Speedway with another teenage prodigy – Cole Custer (the youngest NASCAR national series race and pole winner). Custer, 17, will pilot the No. 00 Haas Automation Chevrolet Silverado in Saturday’s Kroger 250 (2:30 p.m. ET on FOX Sports 1), the first of 10 scheduled races he will run for JRM this season. Last year in his first NCWTS campaign, he amassed one victory, two poles, two top fives, six top 10s and 150 laps led in nine starts. JR Motorsports, owned by Dale Earnhardt Jr., has fielded race teams since 2002 and launched its XFINITY Series program in 2006. The team boasts 23 XFINITY Series wins and 42 late model victories, including track championships in 2012 and 2014. Elliott’s XFINITY Series championship paired with Regan Smith’s runner-up showing in points marked the first time in JRM’s history it secured a one-two finish atop the standings. Notes: Teams in both the NASCAR Sprint Cup and Camping World Truck Series will run the same Goodyear tire codes at Martinsville this weekend . . . this is the same combination of left- and right-side tires that these teams ran at this track last October . . . Martinsville is the only track where NASCAR teams are scheduled to run either of these two tire codes . . . as on most NASCAR ovals one mile or less in length, teams will not run inner liners in their tires at Martinsville. 29 75 Caleb Roark Chevy Food Country USA – Morning Fresh Farms – Lopez Wealth Mgmt. Tyler Reddick launched his 2015 season with flair, leading a race-high 46 laps to win the NextEra Energy Resources 250 at Daytona International Speedway for his first NASCAR national series victory. It was just the 18th start for the 19-year-old Californian, who will run a full schedule this season for Brad Keselowski Racing. Reddick will continue to chase his goal of a NASCAR Camping World Truck Series championship by competing in Saturday’s Hyundai Construction 200 at Atlanta Motor Speedway. Notes: Teams in all three NASCAR series will run the same Goodyear tire set-up at Atlanta this weekend . . . this is the same combination of left- and right-side tires that Sprint Cup and Xfinity teams have run at this track the last two seasons . . . this left-side tire code (D-4384) has actually been run at Atlanta since 2012 . . . this right-side tire code (D-4602) incorporates Goodyear Racing’s multi-zone tread technology, which debuted at Atlanta in 2013 . . . the tire features two distinct tread compounds — one for endurance and heat resistance on the inboard two inches of the tread and one for traction on the outboard 10 inches . . . as on all NASCAR ovals greater than one mile in length, teams are required to run liners in all four tire positions at Atlanta . . . air pressure in those inner liners should be 12-25 psi greater than that of the outer tire. 11 13 Cameron Hayley Toyota Cabinets by Hayley / Carolina Nut Co.
27 75 Caleb Roark Chevy Food Country USA – Morning Fresh Farms – Lopez Wealth Mgmt. It’s down to the seasoned veteran versus the rising star in the NASCAR Camping World Truck Series championship battle. With just two races left, defending champion Matt Crafton leads Ryan Blaney by 23 points heading into the Lucas Oil 150. No matter the outcome at Homestead, at least one championship record will be set. Crafton would be the first back-to-back champion in the 20-year history of the NCWTS, while Blaney would be the series’ youngest champion at 20 years, 10 months and 14 days. Before heading to Miami, the two drivers will make a stop at Phoenix International Raceway for Friday’s Lucas Oil 150. Both have performed well at the one-mile tri-oval located in the Sonoran Desert. Blaney boasts two top-10 finishes in as many starts, while Crafton claims four top-five and nine top-10 showings in 13 races at Phoenix. Neither has won there. True to his word since he took the standings lead, Crafton maintains he is still more concerned with wins than points. Though unlikely, there is a mathematical possibility that Crafton clinches the championship at Phoenix. If he leaves Phoenix with a 48-point lead over Ryan Blaney, Crafton will lock up the 2014 NASCAR Camping World Truck Series title. 31 80 Jody Knowles Ford Clayton Signs, Inc.
Ryan Blaney will log enough mileage this weekend to drive from Charlotte to Miami. He’s not going on vacation though. The 20-year-old is running double-duty duty at Talladega Superspeedway, NASCAR’s largest track, racing 282 laps and 750 miles as he attempts to make a last-ditch effort for the NASCAR Camping World Truck Series championship and play spoiler in his second-career NASCAR Sprint Cup Series start. For his first task of the weekend, Blaney will pilot his No. 29 Brad Keselowski Racing Ford F-150 in the Fred’s 250 Powered by Coca-Cola on Saturday (1 p.m. on FOX). Currently third in the NCWTS standings, Blaney will try to close the 27-point deficit separating him from leader Matt Crafton. He claims finishes of sixth and 21st in his two-career starts at Talladega. Blaney will get one night of rest before he hits the pavement at Talladega again in the NSCS GEICO 500 on Sunday. He will look to improve on his 27th-place effort in his first-ever NSCS start at Kansas in May and potentially steal the win from some Chase for the NASCAR Sprint Cup hopefuls. The 2012 NASCAR Next alum better get used to having so much seat time. Talladega is the first of three double-duty weekends at the final five race venues of the season for Blaney, who will compete in both the NCWTS and NASCAR Nationwide Series events at Texas and Phoenix. Notes: While teams in both NASCAR series in action at Talladega this weekend will run the same left-side tire code (D-4596), they will run distinct right-side codes . . . in Camping World Truck, this is the same combination of left- and right-side tires they ran at Talladega last October . . . in addition, teams in all three of NASCAR’s top series ran this tire set-up at Daytona throughout 2014 . . . as on all NASCAR ovals greater than one mile in length, teams are required to run inner liners in all four tire positions at Talladega . . . air pressure in those inner liners should be 12-25 psi greater than that of the outer tire.